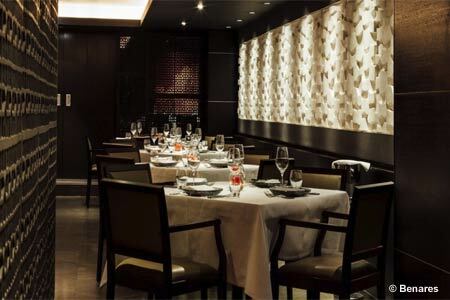 Benares is even more beautiful than ever, and continues to turn out its accomplished Indian cuisine. : Benares is as stylish as one would hope. Enjoy the chic first-floor bar with flower-filled pools, then take your place in the dark brown and cream dining room. The elegant cooking from Atul Kochhar keeps the restaurant’s position as a favorite venue for celebs as well as a destination for serious foodies. Kochhar continues his innovative, self-confident path, taking the classical base of Indian cooking and adding personal modern flourishes. Everything is well done: from the marinating of meats and fish that are cooked so tenderly in the tandoor to the bold spicing of the vegetable dishes. Try soft shell crab with corn spring roll and a peanut and apple salad, or tandoor roast scallop with cauliflower prepared in different styles, followed by cod with vermicelli and a coconut and curry leaf sauce, or perhaps rack of lamb with pickled artichoke and spinach. Desserts are elaborate, like star anise apple Tatin with fennel and vanilla ice cream topped with salted butter caramel. Service is attentive and the wine list is designed to match the Indian food with skill; cocktails are winners. The Bar menu offers sharing dishes. Set lunch and pre-theatre menu 2 courses £29, 3 courses £35.